When I hear the word “bacon,” my mouth immediately starts to water. I also feel strongly that good things come to those who wait. As such, I like to cook bacon slices on the stove over low heat, flipping and rearranging each piece frequently to ensure every bit gets cooked to perfection. In my world, bacon is perfect when it is crispy and falls apart in your mouth. No floppy bacon in this house! Well, except for the time when I tried to leave some uncharred for house guests (my husband promptly named it sushi bacon). Cooking bacon in the oven has only been on my radar for the past couple of years. I have baked it on its own and have also tried it basted in brown sugar and dark beer. My mom likes to bake it with brown sugar and pepper for Bloody Mary’s. My husband introduced me to wrapping bacon around delicious baked foods. 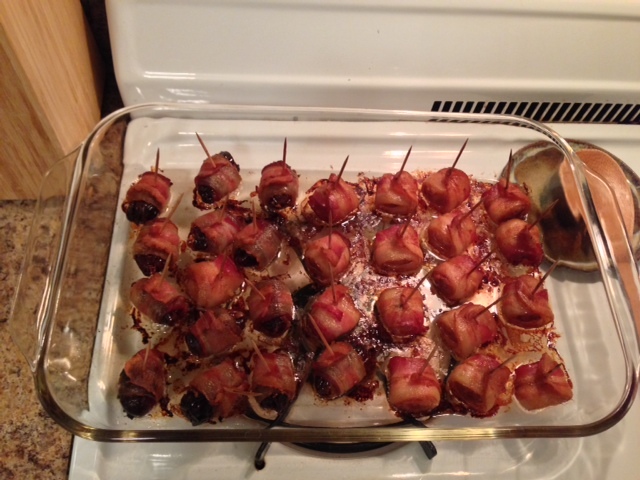 The original recipe he showed me was for bacon wrapped, blue cheese stuffed dates. Is your mouth watering yet?! I recently adapted his recipe into a lactose and gluten-free version for some dinner guests with special dietary requirements. And by using both dates and water chestnuts, you get one chewy, sweet treat and one crunchy, salty treat. You could always just use one or the other if you would like, but I prefer the combo. Pre-heat your oven to 350 degrees. To keep this recipe gluten-free, make sure that your soy sauce and the dates do not contain gluten. (Some companies dust dried fruit in a mixture that contains gluten.) 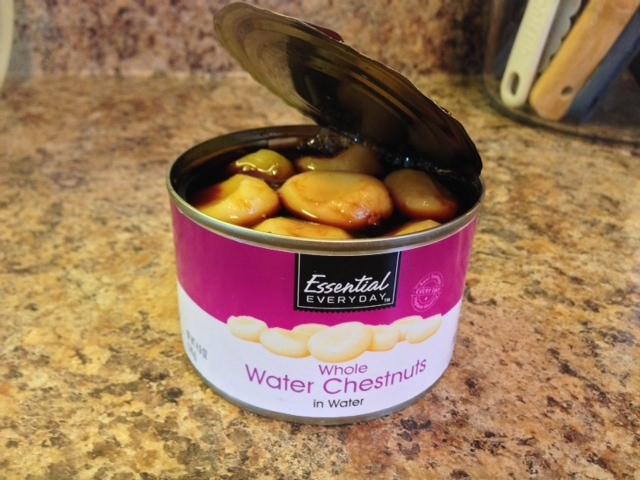 Start by opening a can of whole water chestnuts, draining the liquid. Fill the can with soy sauce to marinate the chestnuts while you remove the date pits. 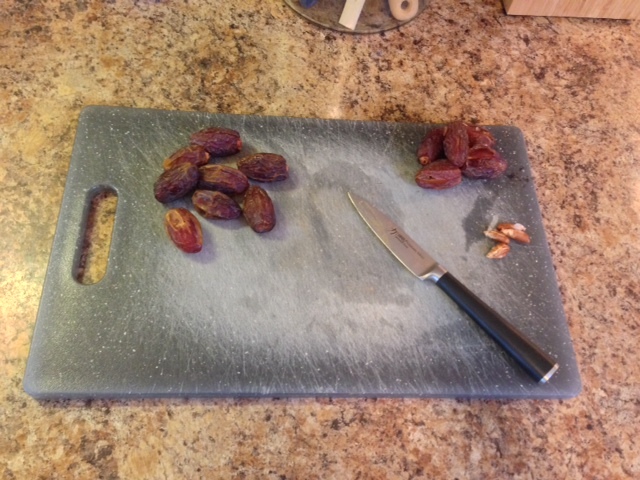 Slice each date lengthwise, removing the pit and stem, if needed. I prefer to use nitrate-free, center cut bacon. (Why? Studies have shown that nitrates can cause cancer and center cut bacon is leaner, with less fat.) Remove bacon from its packaging and slice it in half so that you end up with twice as many strips that are half as long. 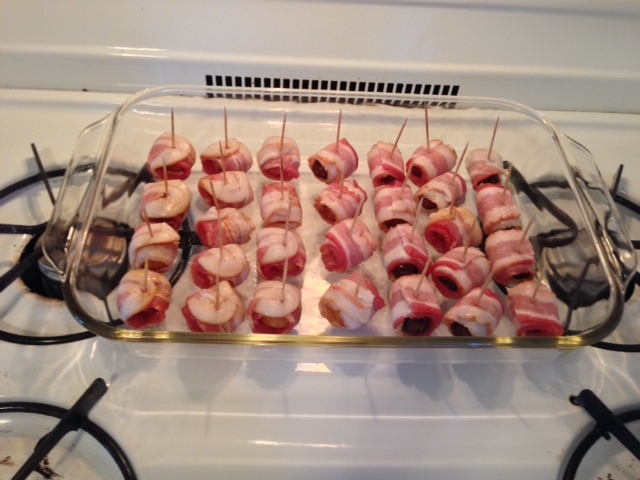 One pound of bacon should yield enough bacon wrapped bites for six people. I ended up with 28 bites from my one pound package. Use half of the strips to wrap each of your dates, one half-bacon strip per date. Use a toothpick to keep everything together and place your wrapped date in a baking dish. Continue until you’ve used half of the bacon. Now you are ready to wrap your marinated water chestnuts. Drain and discard the soy sauce, then follow the same steps as above. One water chestnut per half-slice of bacon, secured with a toothpick. Now your treats are ready to go into the oven! Bake for 30 – 45 minutes or until they are done to your liking. I know not everyone enjoys their bacon as crispy as I do! Remove from the oven and let cool for at least 5 minutes. They will be HOT! Remove them from your baking dish and set them on some paper towel for a minute or two to help absorb the extra grease. Serve them on your favorite platter and ENJOY! 1) Pre-heat oven to 350 degrees. Add about 1/4 cup of soy sauce to the can of water chestnuts to marinate. 2) Slice the dates lengthwise to remove the pits. Some of the dates may still have the stem attached – be sure to remove those as well. 3) Cut your bacon slices in half. 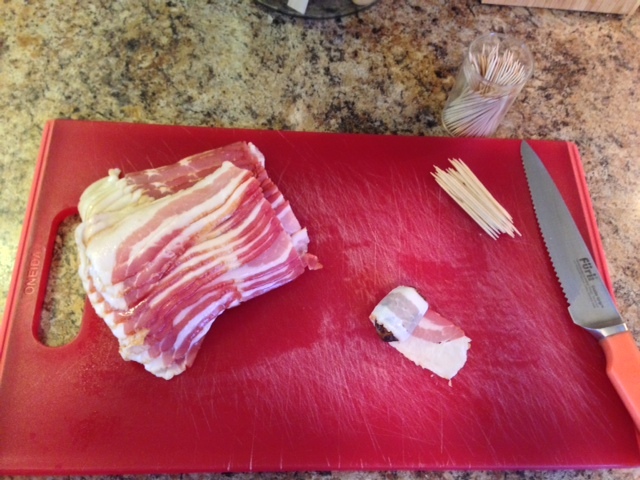 Begin wrapping one date with a slice of bacon and secure it with a toothpick. Place them into an ungreased 9″ x 13″ baking dish. Continue until you have used half of the bacon. Wrap the water chestnuts with the remaining bacon. 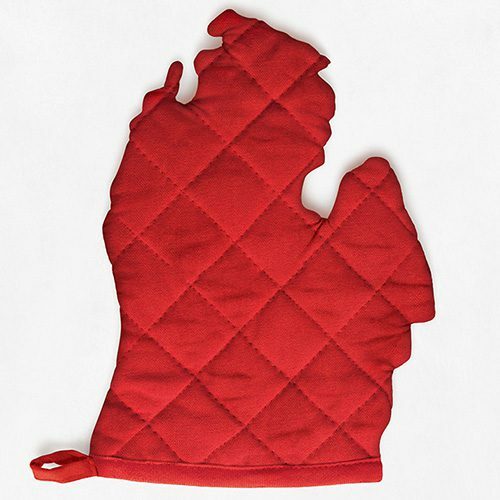 4) Bake for 30 – 45 minutes (or until cooked to your preference). Cool for five minutes. Place on paper towel for a minute or two to remove excess grease. Transfer to your favorite platter and serve. 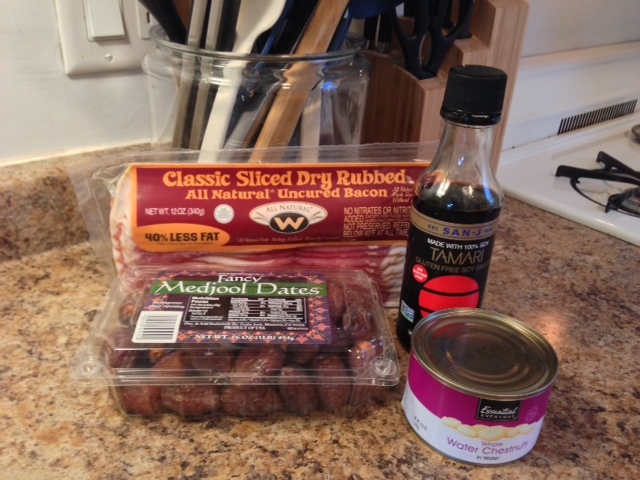 Love your blog and love bacon wrapped dates too!! We like to stuff them with creamy goat cheese. Not gluten-free but yummy. Thank you, Devin! I love your suggestion about adding goat cheese… I will have to try that soon!